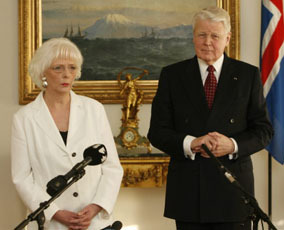 Iceland's Prime Minister, Johanna Sigurdardottir (l), and President of Iceland, Olafur Ragnar Grimsson (r). Photo credit: mbl.is/Omar. Three days after the prorogued federal Parliament returns to work in Canada, the people of Iceland will be voting in an unusual referendum. It has been called, in effect, by the ceremonial head of state, who has doubts about recent controversial actions by the Icelandic parliament and prime minister. Here in Canada, the Iceland example can make you wonder. Concerns have been raised lately about an increasing lack of democracy in our federal political system. Would it be more democratic if our de facto ceremonial head of state — the Governor General — could call referendums about controversial actions by our parliament and (or) prime minister? The particular issue at stake in the Iceland referendum is happily not directly relevant in Canada. Iceland was hit very hard by the great global financial panic more than a year ago now. Among other things, the United Kingdom and the Netherlands spent some $5.3 billion (US) to compensate their citizens’ depositors in Icesave, an internet bank that collapsed with its parent Landsbanki (or National Bank of Iceland) in October 2008. 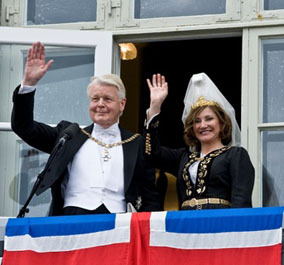 President Grimsson with his second wife, Israeli-born Dorrit Moussaieff, to whom he became engaged in May 2000. The wedding took place on his 60th birthday, 14 May 2003, in a private ceremony held at the presidential residence. President Grimsson’s first wife had died from leukaemia in 1998. More recently, the governments of the United Kingdom and the Netherlands have been urging the government of Iceland to pay back the $5.3 billion. And the request has provoked a vigorous debate inside Iceland. To take just one case in point, $5.3 billion is a lot of money in a very small country with an annual gross domestic product not too much larger than twice that amount. Late last year the government of Iceland nonetheless largely agreed to the kind of payback the United Kingdom and the Netherlands were asking for. And legislation to this effect, supported by Prime Minister Johanna Sigurdardottir (who also just happens to be the “World’s First Openly Gay PM,” though this has nothing at all to do with the issue at stake here) was narrowly passed by the Icelandic parliament. It’s at this point that the situation becomes politically interesting for our rather different Canadian circumstances. Iceland is a parliamentary democracy, similar in constitutional form to Canada. When Iceland became altogether independent from the Danish monarchy in 1944, however, what we still call the Governor General was replaced by an elected President. The President of India, Smt. 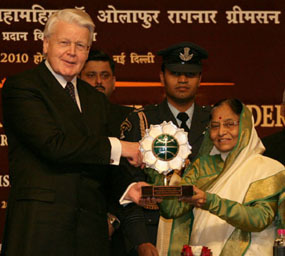 Pratibha Devisingh Patil (r), presenting the Jawaharlal Nehru Award for International Understanding for the year 2007 to the President of the Republic of Iceland, H.E. Dr. Olafur Ragnar Grimsson (l), in New Delhi on January 14, 2010. Even though formally elected, the President of Iceland — like the presidents of such other similar parliamentary democracies as Ireland and India — remains an essentially ceremonial head of state, like the Governor General in Canada. Yet the President of Iceland does retain certain extraordinary powers. And because it is an elected office, the incumbent can actually exercise these powers, when push comes to shove. The current President of Iceland, Olafur Grimsson, has just exercised one of these powers in the controversy over the parliamentary bill agreeing to pay $5.3 billion back to the United Kingdom and the Netherlands. President Grimsson has refused to sign the payback bill into law, because he feels that, at the moment, its particular terms are not in the best interests of the people of Iceland. 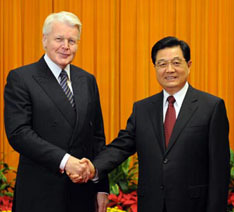 Chinese President Hu Jintao (R) meets with Icelandic President Olafur Ragnar Grimsson, just before closing ceremony of the Beijing Olympic Games, Auguzst 22, 2008. Xinhua/Liu Jiansheng Photo. Meanwhile, it remains a bit tantalizing for us in Canada to wonder what it would be like if our Governor General had similar power to trigger a referendum in unusual circumstances. What if a prime minister of a minority government, e.g., wanted to do something that the Governor General must first approve, and yet felt might be contrary to the wishes of the Canadian people? A referendum to test just what the Canadian people wanted could bring a new pinnacle of democracy to Canadian politics too. Ever since the failure of the Meech Lake and Charlottetown accords in the late 1980s and early 1990s, any kind of constitutional reform in Canada has seemed just impossible in any near future. But the longer our current and increasingly dysfunctional culture of perpetual minority governments goes on, the more we may start to change our minds on this front. Nothing in democratic politics is impossible forever — even in Canada.